You don’t have any extra money floating around. I get it. Many of us live paycheck to paycheck. I’ve been there. We’ve faced job loss and the cost of having 4 kids in three years while in law school. Finances can be tough! Even if you don’t live paycheck to paycheck, there are many priorities that fight for every dime you earn. It can be difficult to find extra cash to spend on food and supplies that you might use one day if there is a disaster. Hopefully, if you are reading this post, you understand why emergency preparedness is so important, so I won’t go into that topic too far other than to say it is insurance! Most of us don’t think twice about paying for car insurance, health insurance, homeowners insurance etc. Having extra food and supplies on hand is simply another form of insurance: one that just may save your life. So even though it can be difficult to spend money on emergency preparedness, it is smart! Today, I have a few suggestions to help you afford it even when you feel you can’t. 1. Start with the free stuff! Learning skills and gaining knowledge rarely costs money…especially in today’s world of free blogs full of great information! You can find loads of free information here on my site. “10 Ways to Prepare for Free” is one of the most popular posts on my site. Check it out! I also suggest you check out my Pinterest Board full of links to all my favorite Preparedness and Homesteading Blogs. These sites regularly post lots of great free information. There are many preparedness supplies you can find at the dollar store! Many of the items in my 72-hour kit come from the dollar store. Make sure you are careful about quality (I wouldn’t buy a cheap can opener that may break tomorrow), but there are many great finds at the dollar store! And this post: Dollar Store Preps is very detailed and helpful. And Shelle’s ideas for a DIY Dollar store first aid kit are fantastic. In addition to preparedness related supplies, you can also purchase many other items from the dollar store and then put the money you save toward saving for emergency preparedness supplies. This article: What to Buy at Dollar Stores should help! (More ways to “find” extra money in #8-11 below). You don’t always have to pay full price for prepping supplies and they don’t always need to be NEW! You may find a wheat grinder or backpack or another expensive tool for just dollars at a thrift store or garage sale. Every couple of years, I pick up clothes one size too big at the thrift store for our kid’s 72-hour kits. In addition, not all emergency preparedness items have to break the bank. You can start with smaller items first. Alright, so those are things you can do on a very small budget. What about when / if you have a bit more money (like tax return time or bonus time, or your are gifted some money, or you’ve been saving for a while) and want to buy a bigger ticket item? Commit to not buying anything unless it is on sale. For example, don’t spend $400 on a Bosch mixer when you can get it for $339 (a recent sale price at Honeyville) if you wait. Know the low price on the big ticket items you want to buy (especially the bigger ticket items) and then be disciplined enough to WAIT until you find that price. Those on my Prep-101 email list get notified every time I find a deal that I know is a LOW price deal. This concept works for lower-priced everyday grocery items as well. You can save quite a bit when you know the sales cycles and purchase/stock up on what is on sale for it’s the lowest price each month. Then, commit to putting aside the money you save for emergency preparedness purchases. 6. Shop Smart: Ask For A Deal. Contact a representative of your favorite company(s) and product(s) and ask them for a deal! Ask when the best time to buy their product is. Ask if they offer bulk discounts. Ask, ask, ask! There are “unadvertised” packages that you can only get directly through a consultant. These packages beat any price you can find (they are even lower than Costco), but they are not available online. Make sure to ask your Thrive consultant (hopefully me!) about them. The “BIG” sales happen twice a year: Black Friday and usually in March. Plan and save up for them! Invest when the food is on sale. Each month there is ONE item that is discounted far below the other sales (called the Q-Pon and only available to Q customers). If it is an item you want in your storage, stock up on THAT item instead of the other sale items during the month. You automatically save 5% anytime you buy something in a case (six of the same item). If you spend over $400 with me (not all consultants offer this) and ASK for it, I will give you back $40+ in free product plus $100+ a product at 50% off. If you find a company or person who sells a product you want, ASK THEM directly (phone or email) how to get the best deal. You can also call and ask if they can meet/beat a price you found elsewhere. I love when people ask me about the products I carry and sell! 7. Consider a different brand / options / seller. I feel VERY strongly about purchasing high-quality supplies and food and I am very, very careful to not waste my money by buying inferior products in an effort to save a buck or two. For example, I only buy my freeze-dried fruits, veggies, and meats from Thrive Life because their quality is so far beyond any other company I’ve found. Anytime I’ve bought/compared their products to the same product elsewhere, the color, taste, and amount of product per can convinces me I’ve made the right choice to stick with them. (1) Amazon often has low prices with no tax or shipping (via Amazon Prime) and you can find the lowest price offered on any product by using Camel, camel, camel. (2) You can also try searching for the product using the Google Shopping Tool to find and compare prices. Consider a different brand. Many higher priced items are offered through various different companies / brands. Oftentimes, the more expensive brand is worth the money, depending on your needs. But sometimes a lower priced item may meet your needs. Shop around. Ask your friends on facebook. Ask your favorite emergency preparedness blogger. Find out which products are worth the money and which have a less expensive, but just as high quality alternative. Grains and other basics. I don’t buy all my grains from Thrive Life. I’ve found them priced more competitively at Honeyville and I love Honeyville’s quality (their cans aren’t as high quality, but since I use my food regularly instead of storing it for 25+ years, this isn’t as important to me). I’ve found that quality on grains and other basics (sugar, beans, rice etc) is not as difficult to master as quality on freeze dried fruits, veggies and meats. So, now you know how to get the best bang for your buck whether you have a lot of money or a little, but what about if you just don’t have ANY spare money at all. How can you find some? When is the last time you called your auto insurance company and asked for a discount? Get quotes from a few different companies and find the least expensive. Call your current company and ask if they will meet (or better yet, beat) that low price. You’d be surprised how many will. Try this with a few companies: Internet, phone, cable, etc. Once you’ve gotten a discount, commit to putting that extra money toward emergency preparedness. Budgets are AWESOME. If you don’t have one, you should! I promise you will find “extra” money when you start living within a budget. But while I believe any budget is helpful, I am a strong proponent of the cash envelope system. But I haven’t always been. I had to find a way to make it work for me. I found actual cash envelopes floating around to be very frustrating. First, they were easy for someone to steal. Second, since my husband and I aren’t always together each time we purchase something, we each needed half of each envelopes budget. That quickly became so many different envelopes that it was just silly. Plus, we didn’t always know exactly what was left in the other person’s envelopes…we weren’t always on the same page. In addition, I like purchasing things on my credit card b/c I get 1%-5% back on my purchases. I didn’t want to give that small extra income. Not to mention, it was a pain each month to go get money out of our checking account and divide it into various different envelopes. Then, I found YNAB. It is an online cash envelope system and I LOVE it! It solves all the above problems and more. My husband and I enter a purchase into the appropriate “envelope” (category) via our phones (take 5 seconds) and immediately we both have an accurate picture of exactly what is left in that category. I can still use my credit cards and we don’t have a million (easy to steal) envelopes floating around. Since starting this budgeting program, we’ve seriously bumped up our savings account while being able to make some fun purchases we’ve been eying for a while (like our new DSLR camera) all while staying within our budget! I LOVE YNAB. Not everyone has non-necessities in their current budget, but if you do, is there something you can cut? Consider using a “dumb” phone instead of a smartphone. Consider using Amazon Prime or Netflicks instead of cable. Consider “brown bagging it” for lunch instead of eating out. Do you really need a gym membership? What sacrifices can you make? You may find $10 a month ($120 a year) or $50 a month ($600 a year) or even more, but even small amounts can and do make a difference. Once you’ve cut some things out, commit to setting that money aside for emergency preparedness! Yes, you could consider getting a part-time job, becoming a Thrive Life consultant, selling on Etsy, making money from home, or starting a blog (here is another helpful article on that) and working from home. But those are kinda BIG undertakings (go for it if you are up for it). There you have it! 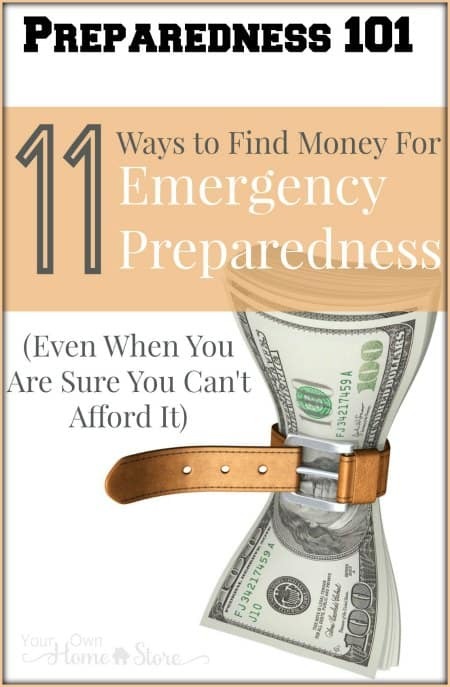 11 ideas to help you find money for emergency preparedness. Decide what you will do to find a way to pay for the items on your “to buy” list that you made last week! Then, take steps to put your plan in motion! Do you have any other ideas? 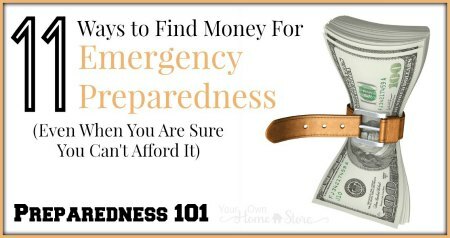 How have you found ways to afford emergency preparedness? Love the DIY list!!! Thanks!!!! Thanks for the great info! So glad I found your blog! I’m so glad you did too Karen! Welcome. I like to accumulate free stuff for my preps. For example, one day when I was putting into the recycle bin some empty plastic juice bottles and those disposable plastic containers that frozen microwaveable meals and other oven-ready or microwave-ready prepared food comes in, I thought about how they could make reusable or even one-time-use food containers during a prolonged power outage. So, now I wash and save some of those plastic containers for emergency use. If I find myself giving my displaced neighbors cooked food, I’d rather serve it in take-away containers rather than hoping to get back my plates and bowls. Nor do I want to wash used plates and bowls with my stored water if the taps stop flowing. Now I wash and save those little white plastic cups that Ready Rice comes in (they are the perfect size for holding a child’s beverage), those various size microwave-safe black plastic containers that Lean Cuisine and other frozen meals come in (perfect for an adult-size serving of beans and rice), and those emptied Ocean Spray bottles (good for giving out drinking water to a thirsty neighbor). Now when we buy a fast food meal, I take away a set of plastic flatware and put that in my emergency closet too, so that anyone who may get a cooked emergency meal from me won’t have to use their bare hands to eat it. One thing I like to do during the summer months is to can/freeze/dehydrate foods. I live in a farming community so there are always places selling farmers fresh produce and fruits. I also feel it’s better to have jars on hand, rather than tin. Plus I can get more in a 1L jar !!! Preserving foods you can get for a good price (or next to free from a home garden) is a GREAT option Janet! So glad you mentioned YNAB! I know many people swear by the physical envelopes of cash (and maybe it’s necessary for some people to practice self control) but I love YNAB for all the reasons you list. Yes, you pay for it, but it’s worth it. And I got my copy free from the training webinar I attended! Awesome Cath. It truly is worth it. This is awesome. You have done a great job of putting this together. thank you so much.